Zeusbox Studio updated their feedicons pack which has more than 10 new icons. Icons are licensed under Creative Commons Attribution-No Derivative Works. Myo Kyaw Htun . com has PageRank 5 !!! Today, woke up early and sat in front of computer and then I saw a tiny PageRank bar from Google Toolbar shows that my site has PageRank 5. Wow! I can’t believe my eyes. And then I was checking with the following tools to see my site PageRank. All of those PR checkers show that My site has PageRank 5. I visited my MountMandalay.net and my brother’s web site. What I found is that each has PageRank 4. Then I continued visiting my friends sites and I noticed that they’re also having increased PageRank. Honestly, my site doesn’t have huge traffic except when I created and posted new theme and has less than 100 visitors a day sometimes less than 50. Most come from other sites that are using my themes or posted about my WordPress Themes but not directly. Anyway, my site has PageRank 5 !!! 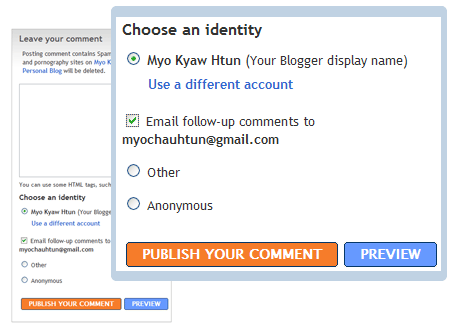 New feature which is very similar to WordPress’s Subscribe to Comments, email follow-up comments, is available at Blogger (Blogspot blog). Happy Blogspot user !!! Waiting for new features !!! Windows live writer doesn’t have an option to change the default language where you’re living to other language in setting. When I download Live writer from Thailand, it gives me this url which is Thai version. I don’t see any option to select the language in download page. During setup, I requested my friend to install it because setup is also in Thai language so I did not understand. After I installed, I see all the menus and setting are in Thai language. This is my third WordPress Theme. This theme is a little bit look like Apple home page but not at all. So I name it, ApploPress. Have fun and enjoy using my theme. Thanks my brother, Myo Han Htun who designed this theme. 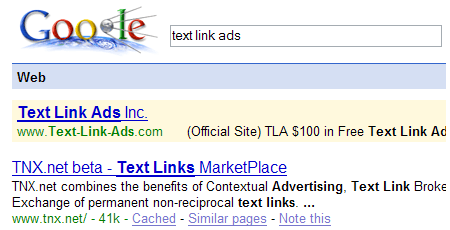 Google penalizes Text Link Ads ? I noticed lately that Google removed Text link ads from search result page. What’s wrong with link broker site that has PR7 ? 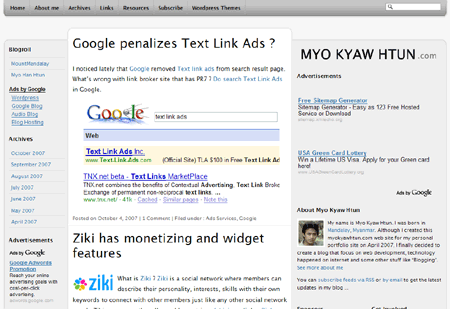 Do search Text Link Ads in Google. I just upgraded to WordPress 2.3. Usually, upgrading wordpress is easy task but not this time. I met a lot of problems while upgrading to 2.3. I disabled some of plugins that use wordpress category table which removed in 2.3. Thanks for Tags, update notification, improved Tiny MCE editor and Pending review features implemented in WordPress 2.3. I disabled Sitemap generator, Ultimate Tag Warrior, Add META Tag plugin as a result. p.s : I’m going to make two WordPress themes available for download soon.